Grin and Bear It, Bears in Greenville Texas. "There's nothing worse than a drunken bear in a department store." That would-have-been-famous phrase almost had its origins in Greenville approximately 103 years ago. At the turn of the 19th century, W.C. English had a slaughterhouse business with three retail locations In Greenville. One was on the south side of the square and two were on Stonewall Street. Animals were rendered and meat offered for sale in butcher's showrooms that looked more like modern-day jewelry stores. Early photos show one of English's front counters with a fancy cash register, gingerbread woodwork overhead and restaurant type bar stools in front. Beef and pork can be seen hanging on meathooks on a long rack on the right side of the picture. One day in 1903, a customer arrived at Mr. English's establishment with another type of stock he wanted butchered - three large bears. The bears are believed to have been retired circus performers. English took possession of the bears, but soon became attached to the tame animals. He offered to buy them; the customer agreed, and "Katie," "Bob," and "Bill" became Mr. English's pets. 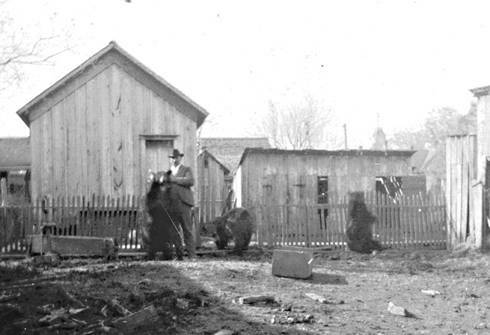 English kept the three bears in the backyard of his home at the corner of Washington and Bois D'Arc streets in Greenville. W.C. English with his bears Katie, Bob and Bill in the backyard of his home in Greenville. Note on the horizon on the right the faint image of the Hunt County Courthouse tower. This was adjacent or just east of today's market square, then known as the OK Wagon Yard. Vendors who came to sell their vegetables and other goods, often from many miles away, soon became familiar with the bears. In those days, many of the farmers and vendors slept in tents or on bedrolls overnight right there on the wagon yard grounds. Some brought food and spirits to supply them during their stay. It wasn't long before it was discovered that Katie, Bob and Bill would share a Friday night indulgence with visitors if a partially-filled beer bottle was thrown over the fence. One Saturday morning after a particularly merry night, one of the bears got loose and decided to take a stroll west on Lee Street. The bear ambled up the sidewalk on the north side of the street past the Hunt County courthouse. Upon reaching an appealing store window believed to have been Perkins Department Store, the bear started inside to have a better look around. By now, onlookers were startled to see the full-grown bear in the middle of downtown. Someone whistled or shouted to get the bear's attention to keep him out of the department store. Shoppers scattered, fearful for their lives that they would be attacked. Luckily, a relative of Mr. English, Mrs. W.F. English, operated a millinery and dress making shop at the corner of Stonewall and Washington. This was on the corner just west of the Sam Swartz store. Mrs. English hurried to the poor bear's rescue and to the dismay of the many residents looking on, she walked directly up to the bear she knew so well to be tame. Laying a hand on the beast's shoulder, she walked it home the few blocks east so that it could complete a recovery from Friday night's excesses. The bear's adventure over and smelling salts returned to their ladies' purses, Saturday morning shopping began to return to normal. "There's just nothing worse than a drunken bear in a department store." This story was related to the author by Eugenia Howse, granddaughter of W.C. English and daughter of early Greenville photographer F.E. Howse.